In my world, no holiday is needed to enjoy chocolate, but the holidays sure are a great excuse to do just that. I posted this recipe last year, almost exactly a year ago, in fact. It stands the test of time, and it’s worth sharing with everyone again. Like many of you, I’ve hardly had time lately to eat a cookie, much less bake them. But my plan is to carve out some time this weekend to make some of these dreamy, delicious, chocolately drops of goodness. Thankfully, the recipe is simple. You’ll be impressed at how the flavors of chocolate, cardamom, and sour cherry play off of each other. Enjoy and have a fabulous weekend! Note: Adapted from a recipe in the December 2009 issue of Body + Soul Magazine. Photo to the right by Stacey Young. 1 cup bittersweet or semisweet chocolate chunks or chips, melted and cooled (If you are avoiding dairy, check the ingredient list to make sure there are no milk products in the chocolate chips/chunks). 2. In a small bowl, whisk together the cocoa and flour and cardamom powder. 3. With a hand mixer, or a stand-up mixer fitted with a whisk attachment, beat the egg whites and salt at medium speed until frothy. (You’ll see bubbles). With the mixer running, slowly add in the confectioners’ sugar. When all of it has been added, raise the speed to high, and beat until the egg whites are the consistency of marshmallows. Now beat in the vanilla. 4. Reduce the mixer speed to medium, and beat in half of the melted, cooled chocolate. Then beat in half of the cocoa-flour mixture, scraping the sides of the bowl to incorporate all ingredients. Repeat with the rest of the chocolate and cocoa-flour mix. Stop the mixer. 5. By hand, gently fold in the cherries, pistachios, and chocolate chips or chunks. Let sit until thick enough to scoop, about 5 minutes. 6. As dough sets, prepare parchment paper and place on cookies sheets. 7. Now it’s time to scoop the cookie dough onto the cookie sheets. Scoop by the level teaspoonful. Leave about an inch in between cookies. Try to keep the cookies the same size to ensure they cook evenly. 8. Garnish cookies with whole and/or pistachio pieces. Looks so festive and pretty! 9. Bake 6-8 minutes, until cookies are a bit cracked on the outside. (I personally like my cookies on the soft, moist, and chewy side, so 7 minutes was plenty of time for mine in my particular oven. If, like me, you prefer softer cookies, remember, they might look slightly undercooked when first taken out of the oven). 10. Remove from oven and let cool. This is the part where recipes always say to cool the baked goods on a wire rack. Well, I don’t own any wire racks, so mine just cooled on the sheets, and no one’s complaining. Updated to Add a BONUS: Fun Weekend Contest. Win a $50 shopping spree on one of my favorite sites, iherb.com . Stop by Love Veggies and Yoga, one of my favorite blogs, to find out how. Did you know the cookie was actually invented in ancient Persia (now Iran) in the 7th century, A.D.? 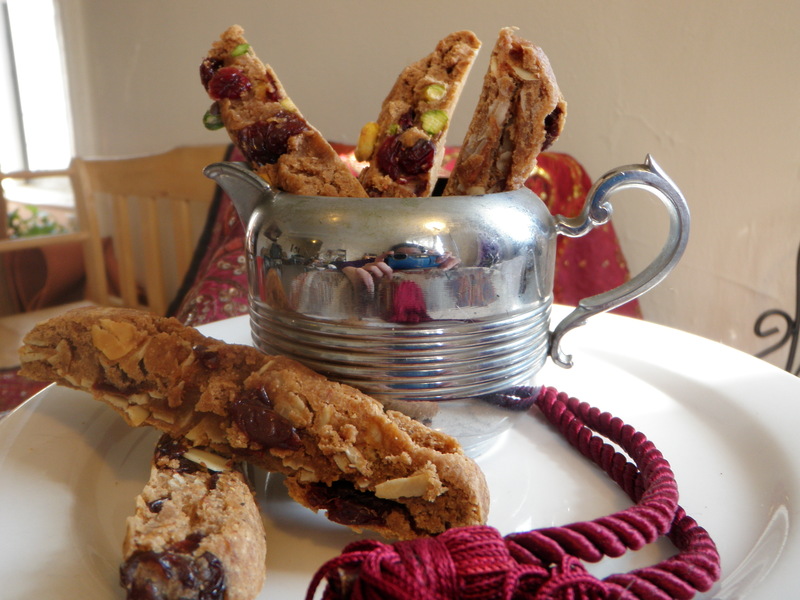 My Vegan Biscotti with a Persian twist are a much more recent addition to the cookie lexicon. Up until a few days ago, I’d never made biscotti at home. I don’t know what switch got flipped in my brain, but suddenly it seemed like a great idea. Plus, adding a Persian twist (Persianizing, as my friend My Persian Kitchen says) would be a way to get creative. What if I upped the ante and tried to make them vegan? Hmmm, now that’s a thought. The earliest cookie-style cakes are thought to date back to 7th century Persia A.D. (now Iran), one of the first countries to cultivate sugar (luxurious cakes and pastries in large and small versions were well known in the Persian empire). According to historians, sugar originated either in the lowlands of Bengal or elsewhere in Southeast Asia. Sugar spread to Persia and then to the Eastern Mediterranean. With centuries of culinary history behind me, you’d have thought my cookies would be perfect on Take One. Ehhh, not so much. My first attempt looked promising, but ultimately ended up overbaked. It was totally due to miscalculations and wrong assumptions on my part. I thought the cookies weren’t done, so I kept baking them. I swear they looked undercooked. Almost raw in spots. Thankfully they didn’t burn, and still tasted fine when dunked in tea and allowed to soak, but unless soaked a bit, they were a hazard to my dental work, and that of anyone else who ate them. Lesson learned. 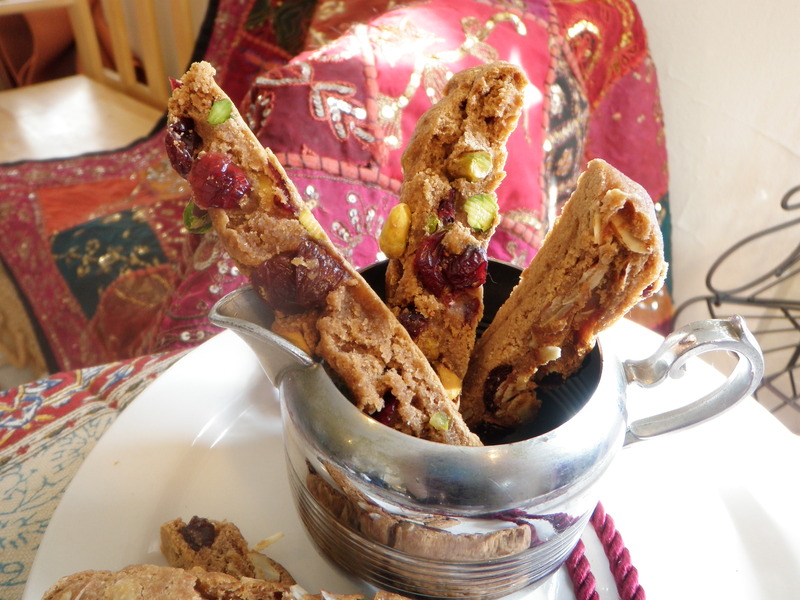 Biscotti jazzed up with pistachios, cardamom, and dried cranberries. Sour cherries would work well, too! 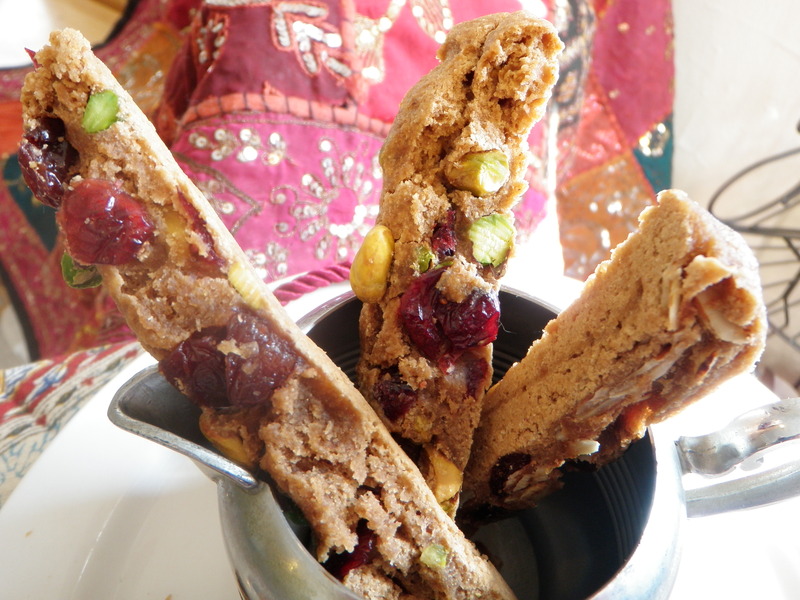 I made two types– for half of the biscotti I added pistachios, cardamom powder, and dried cranberries to the dough. For the other half, I did sour (tart) cherries, almond extract, and slivered almonds. Tart cherries were on offer at my local Trader Joe’s this week, by the way. Love that, because they’re not always there, and their dried bing cherries get a thumbs down from me. Sorry, TJ’s. I call ’em like I see ’em. The Cherry Almond Biscotti were, taste-wise, my favorites. They're in the foreground, on the the plate. The Pistachio Cardamom Cranberry biscotti were quite good as well, and more photogenic. Taste-wise, the sour cherry biscotti were my favorites. But the pistachio cranberry cookies, while no slouch in the taste department either, were notably more photogenic. This is probably due to the interplay of the green pistachios against the dough and in contrast to the jewel-toned dried cranberries. 1. Preheat your oven to 325 F and lightly oil one large or two smaller cookie sheets. 2. In a large bowl, whisk together flours, salt, baking powder, and cardamom powder if using. 4. In thirds, gently add and stir sugar mixture into the flour mixture. Batter will be very thick. Add the nuts and fruits. Finish the mixing with your hands. 6. Bake the logs for about 25 minutes. Remove from the oven, and cool on a wire rack. As they cool, drop the oven temp to 300 F.
7. Cool the logs on a rack for 15 minutes. Cut the logs carefully with a sharp knife straight across into 1/2 inch wide slices. 8. Place the slices cut side down on the cookie sheets and bake for 5-10 minutes more. 9. Turn the slices over and cook 5-10 minutes more, or until golden on bottom. NOTE: The biscotti might look under-cooked. They almost certainly are not. They will harden up as they sit. 10. Cool on racks, then store in an airtight container for up to two weeks. 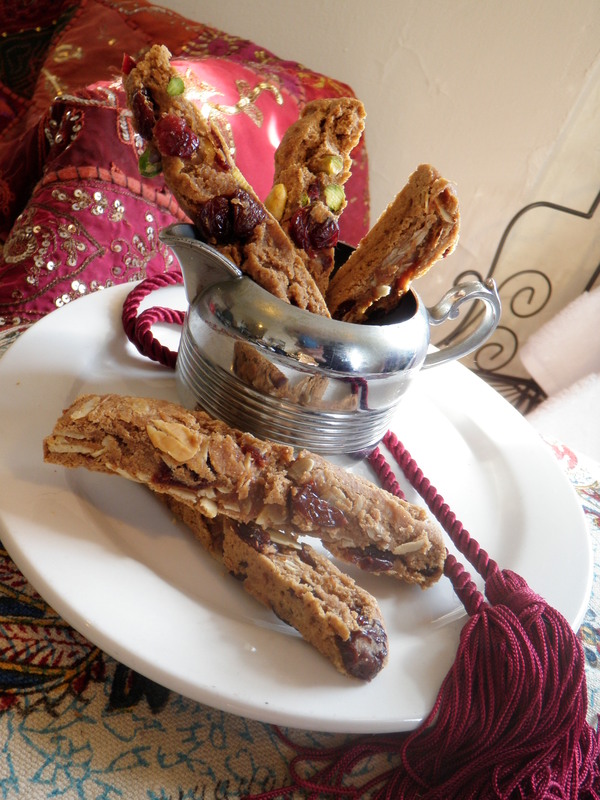 Biscotti with a Persian flair. Pistachios, dried cranberries, and cardamom. Recipe to follow later this week. Chocolate Drops with Sour Cherries and Pistachios. We enjoyed these at Christmas. Why not again for Valentine's Day? Photo by Stacey Young. It’s Chocolate Week here on West of Persia. Yep, nothing but chocolate recipes. Hooray! So Valentine’s Day is right around the corner, and is as perfect an excuse as any to hold a Chocolate Week. Any holiday that involves chocolate and love is fine by me. 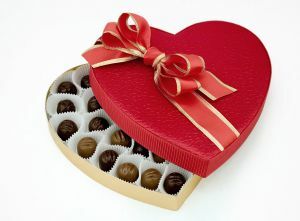 Ever gotten a half-eaten box of chocolates as a gift? I have. I was more bewildered than angry. Ha! Let’s get one thing out of the way right off the bat: sometimes it’s easy for forget that LOVE isn’t just romantic. There are so many corny movies and songs out there and other goofy messages from society that tell us that romantic love is the most important type of love. Sure, it’s a big deal and undeniably wonderful, but it’s not the end-all be-all of love. As I’ve been telling my Yoga students lately, there are many kinds of love. Love of family, love of friends, love of a hobby or a place, to name a few. And of course, there’s the love of chocolate. Yes, this chocolate is one food I truly love like no other. Chocolate and I have had a long and sometimes tumultuous relationship, I gotta tell ya. Never a dull moment. I just can’t walk away 😉 Even when chocolate’s bad, it’s still pretty good. Now that’s what I’m talkin’ about! 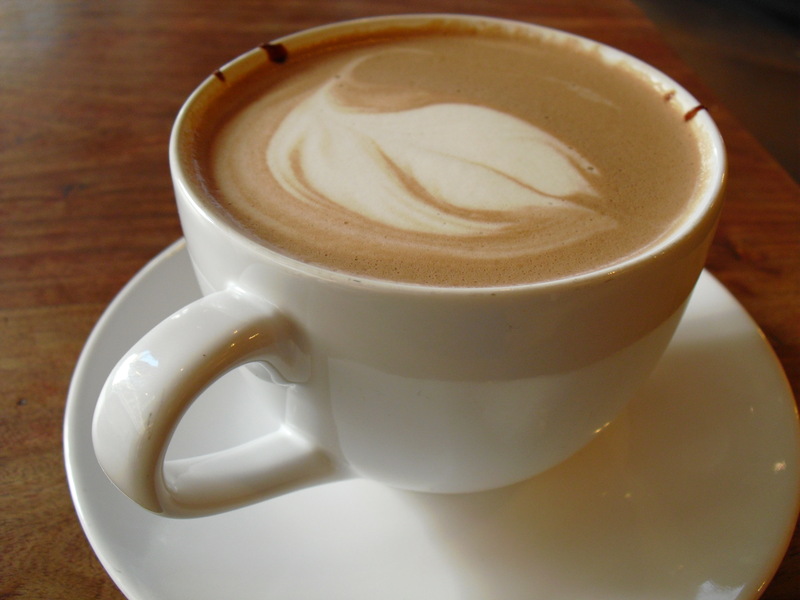 Persian Hot Chocolate has luxurious flavors of saffron and cardamom blended into a velvety dark chocolate. One of my Yoga students and I were talking recently about found objects. He was rocking a sweater that he’d lost for two years. He’d come across it recently, buried deep in a closet. He was slightly thrilled to have pulled it from the abyss. It was there waiting for him all along, it seemed, even though he’d long ago written it off as lost. “Finding something like that is kind of like finding an old friend, isn’t it?,” I asked. He agreed. The same concept can certainly apply to food, I think. One of my most precious lost-then-found foods? Halva. Years ago, as a kid visiting family in Iran, I remember eating this pasty, thick, energizing treat with breakfast. As a kid with not too many culinary points of reference, I remember it reminded me of a mild peanut butter, with a drier texture. One of the many things I liked about it, even then, is the way it was sweet, but not too sweet. Turns out I was right–it was indeed a nut butter, and one that was sweetened, but not aggressively so. Well, technically, the one I remember was a seed butter. Of sesame seeds in particular. . .But let me not get ahead of myself. 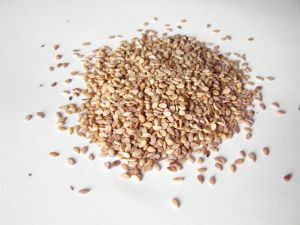 The type of halva I remember from childhood was made from a sesame see base. In Arabic, it's called halawa. It's all based on an Arabic root word, halwa, that means sweet. Many years passed, and I sometimes was reminded of that amazing food, but never thought to ask anyone what it was, or even where I could find it. I’d only had it a few times, but I’d find myself missing it from time to time. But halva was somehow locked away in a time warp, a part of my past I’d allowed to slip away. More time passed, and one day, after moving to New York, a friend casually shared some with me. At first, I didn’t think it could possibly be the treat I’d enjoyed so many years ago at my aunt and uncle’s house, eating a breakfast spread out on a tablecloth on the floor, surrounded by cups of steaming tea and chattering family and love. But it was. “What is this stuff called?,” I asked. Because you see, I’d never known its name. 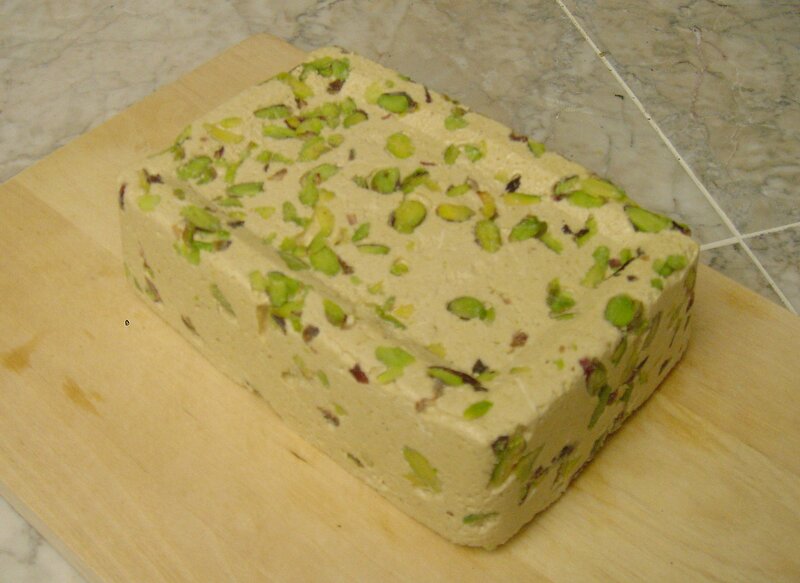 Pistachios are one of many types of nuts that can dress up halva. Memory has a funny way of distorting things. It’s easy to idealize or demonize the past. In the many times I’d wondered about halva, I’d also thought, in the very next moment, that there was no way it could possibly be as delectable as I remembered. I was so, so wrong. It was even better than I remembered. Ok guys, don’t laugh. I have to admit that tears sprang to my eyes when I ate that first bite of halva after so many years. It was like being reunited with a long lost friend. With a past that still lives in my heart and with the family I haven’t seen in so very long. With my childhood memories. Unbelievable. The fact that I could walk down memory lane via halva? Kinda crazy, I know. That I can walk to a nearby store and actually buy this stuff still boggles my mind. For that reason, I don’t eat it all the time. It seems too precious for that, somehow. So I buy it occasionally, and really savor every rich, dreamy bite. I suppose I could learn how to make it, but I haven’ t yet bothered. I’ve since learned that one could have an entire department store devoted to halva. The kind I had was only one of many versions. There are flour and semolina-based versions. 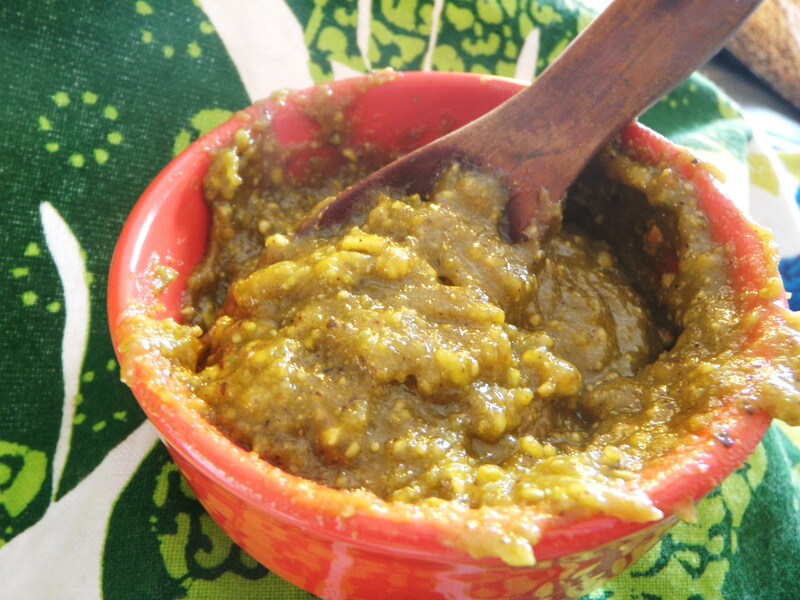 There are halvas based on lentils and even vegetables like pumpkin. Every country and region and probably even province from Greece to Afghanistan seems to have its own take on halva, with the spelling variations to match 😉 . Which is wonderful, and I hope to try as many as possible. For now, though, I’m content with the minor miracle of having halva back in my life in the first place. And yes, I sometimes even still tear up a bit at that first bite. Which I suppose is somehow appropriate–Only as an adult did I learn that halva is a traditional food at funerals in Iran. Passing into the next life with something sweet, nourishing, and light for those left behind to enjoy? There could be worse things, I suppose. 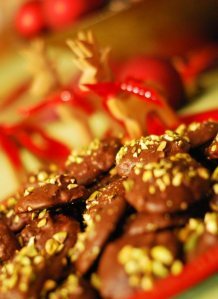 My holiday gift to you: Chocolate and Sour Cherry Drop Cookies topped with pistachios. Photo by Stacey Young. Today’s recipe is a fabulous holiday cookie, with a Middle Eastern twist. It’s loaded with some of my favorite ingredients: chocolate, sour cherries, and gorgeous green pistachios. But get this: it’s also dairy-free and uses very little flour. Now don’t get it twisted and start thinking I’m trying to spring health food on your around the holidays. Not at all! The taste of these babies? Absolutely decadent. The texture is brownie-like, with extra little bursts of flavor from the cherries, pistachios, cardamom, and chocolate chunks. Back in the day, my friends and I used to hold holiday cookie baking parties. It was such a blast, and everyone got to take home a big batch of several different types of cookies. The idea was to package the different varieties of cookies into gifts. Something tells me that not many of those cookie gift packets made it out the door once we all got safely home with our respective cookie stashes. 😉 I haven’t thrown, or been to, such a party in awhile, but the next time I do go to one, you know these cookies will be my contribution. Pistachios can be pricey, especially if you buy them already shelled. I went ahead and splurged for this holiday cookie recipe. The time saved was worth it to me. 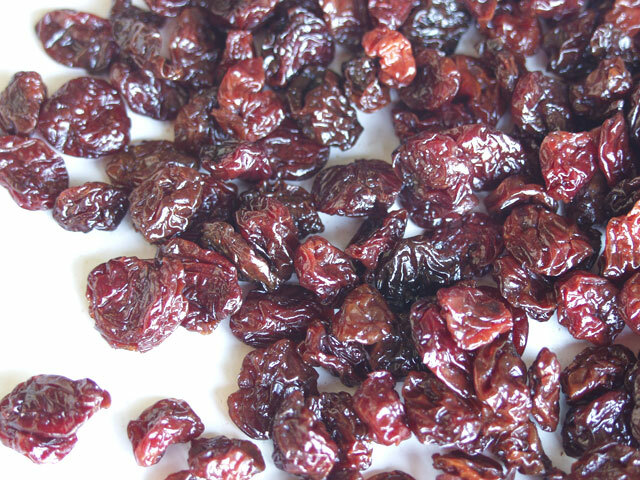 Dried sour cherries are my favorite dried fruit. They bring back memories of Iran, where I used to eat soooo many of these! In my recipe, I used chocolate chunks, but chips will do. Just be super watchful as you melt them. On my stove, it took all of a minute, maybe even less, on LOW heat. Note: Adapted from a recipe in the December 2009 issue of Body + Soul Magazine. 3. With a hand mixer, or a stand-up mixer fitted with a whisk attachment, beat the egg whites and salt at medium speed until frothy. (You’ll see bubbles). With the mixer running, slowly add in the confectioners’ sugar. When all of it has been added, raise the speed to high, and beat until the egg whites are the consistency of marshmallows. (This took me about 5 minutes with the hand mixer. Yes, I’m low-tech like that. The gorgeous Kitchen Aid stand mixer has yet to make an appearance in my life. Santa, are you listening?) Now beat in the vanilla.